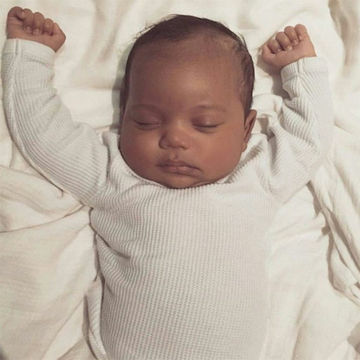 The First REAL Photo of Saint West is Here! We've finally caught a glimpse of baby Saint West from mama Kim Kardashian, and it does not disappoint. See the handsome little guy's first public photo right here. He was born back in December but we haven't seen a photo of Saint West's face until just now—but it was worth the wait. We've finally scored a look at the little one and he is absolutely adorable. Kim Kardashian West shared the first public photo of her son on her app. As it turns out, she chose to post the photo today for a very special reason. "Today is my dad's birthday. I know there's nothing more in the world he would have wanted than to meet his grandchildren. So I wanted to share this pic of Saint with you all," the reality star wrote alongside the photo. Her father, Robert Kardashian, passed away from esophageal cancer in 2003. Saint is wearing a white onesie in the photo. He's raising his arms above his head and looks perfectly content. Up until now we've only seen a photo of the youngest member of the Kardashian Klan's hand—Kim also shared a photo of him holding hands with his big sister. Kim isn't the only family member who proudly showed off Saint's adorable photo. Kris Jenner also posted the photo to her Instagram account along with the caption: "Good Morning everyone...meet my grandson Saint!!!!! He's a little lovebug and an amazing gift from God. #blessed #love #precious #saintwest."